RIYADH, Saudi Arabia -- Saudi Arabia and Ukraine have set out a new vision of bilateral relationship with plans to boost cooperation in different sectors, especially in commerce, defense, agriculture and tourism. Defense Minister Prince Salman holds talks with Ukrainian Foreign Minister Kostyantin Gryshchenko in Riyadh on Tuesday. Riyadh and Kiev have also agreed to coordinate their positions on a range of subjects of common concern, while the two sides have jointly sought to strengthen their fight against piracy at the sea, terrorism, extremism and organized crime. “Prince Salman, minister of defense, and Ukrainian Minister of Foreign Affairs Kostyantin Gryshchenko held talks here Tuesday and they agreed to boost cooperation in defense sector with a plan to set up a panel to explore possibility of cooperation,” said Konstantin Zhumenko, a spokesman of the Ukraine Embassy. 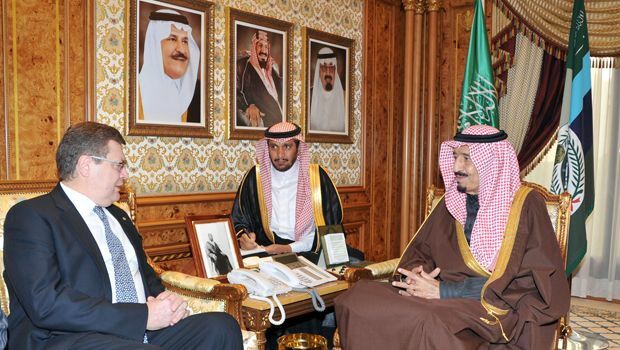 Gryshchenko had wide-ranging talks with Prince Salman. He later met Foreign Minister Prince Saud Al-Faisal and Minister of Agriculture Fahd Balghunaim. The Ukrainian minister also met with Prince Mansour bin Miteb, minister of municipal and rural affairs; Jabara Al-Seraisry, transport minister, GCC Secretary-General Abdullateef Al-Zayani and Shoura Vice Chairman Mohammed bin Amin Jefry. “The two sides discussed a range of subjects of common concern, including the developments in the Middle East as well as subjects in the global context,” said the embassy spokesman. Referring to the minister's talks with Prince Saud, he said Kiev supported the Saudi position on tensions in Middle East flashpoints. “The talks also focused on bilateral relations and ways to further improve the relations,” said the spokesman. Ukraine has also been concerned about numerous cases of piracy in the western part of the Indian Ocean and the Gulf of Aden. It has offered to work together with the Kingdom and other nations to fight piracy.